Backed by an impressive list of investors, Zaarly, a web and mobile service that connects buyers and sellers in a localized market place, is launching to the public today. As we’ve written in the past, Zaarly is a mobile-centric reverse Craigslist service. Here’s how Zarrly works. On the site or via the startup’s mobile apps, you post what you’re looking for (i.e. cupcakes), how much you’re willing to pay for it and how soon you need it. Zaarly will then share your request in the local community through the platform, and also allows you also post your request to Twitter and Facebook. People or businesses nearby can access and see your request and then anonymously message each other to complete the transaction of delivering the cupcakes you want. Sellers bid for the tasks, and the buyer chooses the best one, with Zaarly connecting the two via an anonymous Twilio-powered phone number. You can use cash or Zaarly’s integrated credit card payment system to pay for the transaction. One of the compelling parts of Zaarly is that it is mobile centric. The company offers a rich HTML5 mobile app, and has launched a free iPhone app. 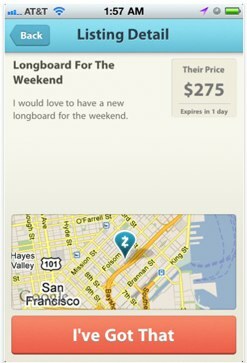 Zaarly also offers a Facebook app as well. And Zaarly has pretty incredible story for a fledgling startup. The company’s founding team of Bo Fishback, Eric Koester and Ian Hunter conceived of and built the prototype for Zaarly in February 2011 at Startup Weekend Los Angeles. The company won this competition, raised funding from an all-star list of angels and investors, and then debuted a test run at SXSW in March, where Zaarly processed over $10,000 in transactions in less than 48 hours. Zaarly’s investors include include Ashton Kutcher, Felicis Ventures, Paul Buchheit, Bill Lee, Naval Ravikant and Lightbank.